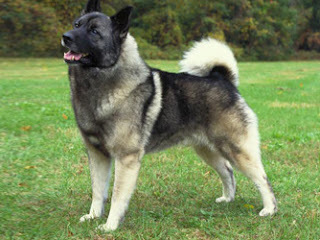 The Norwegian Elkhound was developed in Scandinavia and is one of most ancient and old dog breed of all times, this breed is almost 1000 years old and has been around since the stone age. This dog breed was working as a hunting dog and was a good protector, this dog was used for a big or small hunting game for animals such as moose,elk,bear etc. the way of hunting is quite interesting they track the quarry and then tell teir master by barking and they can hold the animal at bay until the master or hunter arrives Their hunting habits somewhat depend on the way they are trained. This dog breed is a small to medium sized and speedy dog. It's body is short and they are very energetic. Their back is straight and strong. The head of this breed of dogs is big and broad at the ears. Their muzzle is thick at the base with a clearly defined stop. Their eyes are small and are medium in size generally the eyes are brown the hair are on the head of the dog the legs look straight from front, The oval paws are small and tight with thick pads. Their tail is high and tightly curled over the back.This dog breed is friendly in nature and has a bold personality and brave attitude but some times they are reserved with the people whom they don't know. The Norwegian Elkhound are good with family and friends because of their friendly nature, they are known for their enthusiasm trustfulness and energetic behavior, this breed is usually good with children. They want to be independent and have a mind of its own. This breed of dogs is known to gain weight easily so it should not be over fed. This breed of dogs lives for about 12-15 years. Keep an eye out for any other health problems and if you notice any symptoms consult a vet at the earliest for diagnosis and treatment, keep your pet healthy and provide it with a good environment to keep it comfortable.